Rutabagas are an overlooked root vegetable. Plenty of people have never even tried them, and just as many probably couldn't pick them out of a vegetable line-up. Rutabagas look a lot like turnips. A lot. The difference is they have a bit of a yellow rather than a white hue. As that color difference might indicate, rutabagas are decidedly sweeter than turnips, with none of turnips' famously sharp bite. 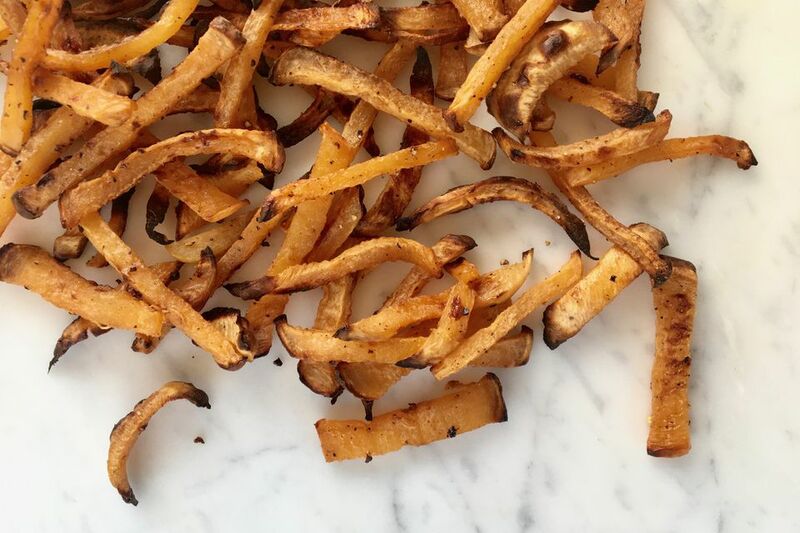 Here, the naturally sweet taste of rutabagas gets highlighted in a version of baked French fries. Serve them as you would fries. A side of ketchup works, of course, but these have so much flavor already, you might find, like we did, that you don't need the ketchup boost. Preheat an oven to 450 F. Trim off and discard the stem and root ends of the rutabaga. Peel the rutabaga. Use a sharp knife or a kitchen mandoline, if you have one, and cut the rutabaga into evenly sized sticks or fries. If using a knife, first cut the rutabaga in half, then cut each half into even 1/4-inch thick slices. Stack the slices and cut them the other direction into 1/4-inch thick sticks. Repeat with the remaining half of the rutabaga. If using a mandoline, set it up for wide julienne and push the rutabaga through—note that rutabagas have a fairly thick or dense texture, and it can take some force to get them through the julienne setting on mandolines. Put the rutabaga sticks in a large bowl and drizzle with the oil. Toss the sticks so they are thoroughly and evenly coated with the oil. Sprinkle with the pepper and/or garlic powder, if using them, and toss to distribute them evenly over the rutabaga. Spread the rutabaga sticks in a single layer on a lightly oiled baking sheet or a baking sheet lined with parchment paper. Sprinkle the sticks evenly with the salt. Bake the rutabaga sticks for 20 minutes. Remove the pan from the oven and turn over the rutabaga sticks. Return to the oven and bake until they are tender and well browned, about 40 minutes. If the rutabaga sticks towards the edges are more browned earlier, you can take them off the pan and return the rest to brown all the way. The appeal of these baked fries is the contrast between the crispy edges and the sweet tender centers, so don't skimp on the cooking time. Spice It Up: Use the black pepper and add 1/4 - 1/2 teaspoon cayenne. Herby: Toss the hot fries with 1/2 teaspoon finely minced rosemary and/or thyme. Garlic Fries: Toss the hot fries with 1 clove garlic, minced, and 1 tablespoon minced parsley.